↑ "Faces of the week". Archived from the original on 2003-09-26. http://news.bbc.co.uk/2/hi/uk_news/magazine/3142618.stm. ↑ "info.cern.ch – Tim Berners-Lee's proposal". Info.cern.ch. http://info.cern.ch/Proposal.html। আহৰণ কৰা হৈছে: 21 December 2011. ↑ "Draper Prize". Massachusetts Institute of Technology. http://web.mit.edu/newsoffice/2007/draper-prize.html। আহৰণ কৰা হৈছে: 25 May 2008. ↑ "People". The Web Science Research Initiative. Archived from the original on 28 June 2008. http://web.archive.org/web/20080628052526/http://webscience.org/about/people/। আহৰণ কৰা হৈছে: 17 January 2011. ↑ "MIT Center for Collective Intelligence (homepage)". Cci.mit.edu. http://cci.mit.edu। আহৰণ কৰা হৈছে: 15 August 2010. ↑ "MIT Center for Collective Intelligence (people)". Cci.mit.edu. http://cci.mit.edu/people/index.html। আহৰণ কৰা হৈছে: 15 August 2010. ↑ "Web's inventor gets a knighthood". BBC News. 31 December 2003. http://news.bbc.co.uk/1/hi/technology/3357073.stm। আহৰণ কৰা হৈছে: 10 November 2015. ↑ "Creator of the web turns knight". BBC News. 16 July 2004. http://news.bbc.co.uk/1/hi/technology/3899723.stm। আহৰণ কৰা হৈছে: 10 November 2015. 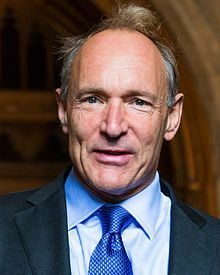 ↑ "Timothy Berners-Lee Elected to National Academy of Sciences". Dr. Dobb's Journal. http://www.ddj.com/217200450। আহৰণ কৰা হৈছে: 9 June 2009.